Micro ATX, ATX size up to 12.5" x 10.5"
Side vent duct doesn't line up with my processor. Other Thoughts: If you have one of the newer oversized video cards this case is perfect. Pros: The case is built very well. It has a unique transparent over matte black front with silver rivets which gives a rugged yet sleek look to it. The front ports ( USB, audio and mic ) have a neat little pull down door that conceals them. It has spaces for two 80mm fans and vents in the front of the case for added air circulation if desired. The modular drive bays are a nice touch too, so you don't have to sacrifice looks for functionality. Right and left side panels are easily removed via thumb screws and slide right off so you can get inside and tinker. The on/off button has a nice responsive click to it and the blue light looks cool but doesn't subtract from the rest of the case. Cons: Only a couple of cons and they are minor. Like all cases this one is a dust magnet. The side vents in particular attract loads of dust for some reason and I have blow them out about once every 1.5 weeks. The front of the case also gets fairly dusty which is made more apparent because of the clear cover which you can dust out using a can of air. Other Thoughts: I am in the process of putting together a new rig and after looking at various cases for several months i haven't found one that really catches my attention. Price for value with this case is exceptionally high and I'm actually considering just buying another one... why mess with a good thing? Pros: Well built, looks great, has plenty of room inside for a mid-tower. I wanted a sturdy case (w/o PS) that would show off the internals; this works and the price was right. Cons: 80 mm fan is kind of loud; replaced it with a quiet 120mm. Two comments that others have made I echo: WATCH YOUR FINGERS AND HANDS!!! Some of the cutouts are like razor blades. The other is that dust does tend to collect under the (cool when it's new) front plastic bezel. Oh well. Other Thoughts: Used it to put together a bunch of spare parts I had laying around. ASUS M2N-SLI, EVGA 9800, a couple of WD drives and a Lite-on DVD R/W. Nothing special but, everything went in with plenty of room for additionals. Some kid will get a good first computer. Pros: This is the best computer case in the world. I have four of them on my system. One for video, one for picture, one for music and the fourth one to surf the Net. It is also a great system, with 64 gigs of ram, and 4.000 gigabites of HD. Cons: Case came in with 3 one inch cracks near the front usb/audio ports. 2 were from the corner rivets and the other arched to the usb audio ports. These all were on the plexiglass on the front. Pros: Well built little steel mid-tower perfect for a budget or even a lower mid-range build. Much nicer than I expected at the price point I got it for. Isn't one of those cheapo cases requiring a couple of guys with lead pipes and a blowtorch to go all medieval on any welded in back-plates. Cons: Apart from the fact it didn't self-install any components into itself... absolutely none. Other Thoughts: Case is packaged a little thin for shipping, but UPS never damages my stuff. Your mileage may of course vary. Pros: A great case considering the price. 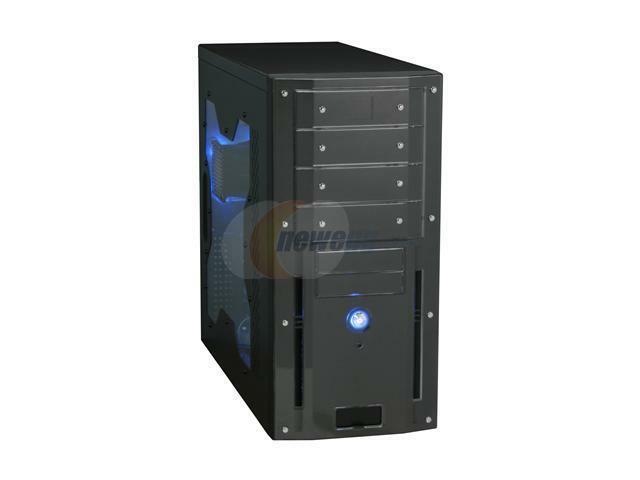 Components fit well and case is very well made considering the price. Cons: Power LED and 80mm Case Fan are powered via a Molex. Therefore, no fan speed monitoring and no blinking power LED in sleep mode. It would be nice if the power LED also had a motherboard connector in addition to the Molex. These are minor comments. Other Thoughts: I would recommend reading the various reviews before purchasing this case. A number of the negative comments would seem reasonable if the case were priced at $200 but for the price it is an excellent case. The 80mm fan is a little loud so I replaced with a Nexus 120mm that is almost silent. Pros: Great case for the price. Cons: Only comes with one 80mm fan. Other Thoughts: Can accomodate 2 80mm fans in the front and 1 120mm fan in the rear.